This was on the AP wire today. An interfaith group released a new textbook Thursday aimed at teaching public high school students about the Bible while avoiding legal and religious disputes. 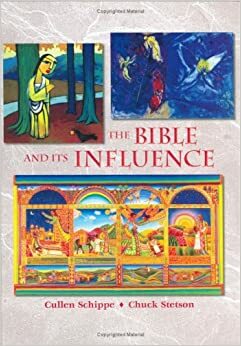 The nonprofit Bible Literacy Project of Fairfax, Va., spent five years and $2 million developing "The Bible and Its Influence." The textbook, introduced at a Washington news conference, won initial endorsements from experts in literature, religion and church-state law. American Jewish Congress attorney Marc Stern, an adviser on the effort, said despite concern over growing tensions among U.S. religious groups, "this book is proof that the despair is premature, that it is possible to acknowledge and respect deep religious differences and yet still find common ground." Another adviser, evangelical literature scholar Leland Ryken of Wheaton College, called the textbook "a triumph of scholarship and a major publishing event." The colorful $50 book and forthcoming teacher's guide, covering both Old and New Testaments, are planned for semester-long or full-year courses starting next year. The editors are Cullen Schippe, a retired vice president at textbook publisher Macmillan/McGraw-Hill, and Chuck Stetson, a venture capitalist who chairs Bible Literacy. The 41 contributors include prominent evangelical, mainline Protestant, Roman Catholic, Eastern Orthodox, Jewish and secular experts. Religious lobbies and federal courts have long struggled over Bible course content. To avoid problems, Bible Literacy's editors accommodated Jewish sensitivities about the New Testament, attributed reports about miracles to the source rather than simply calling them historical facts and generally downplayed scholarly theories -- about authorship and dates, for example -- that offend conservatives. Educators know biblical knowledge is valuable -- 60 percent of allusions in one English Advanced Placement prep course came from the Bible -- and that polls show teens don't know much about Scripture. Yet few public schools offer such coursework, partly due to demands for other elective classes, partly over legal worries. The U.S. Supreme Court's 1963 decision barring schoolroom Bible recitations said that "the Bible is worthy of study for its literary and historic qualities" if "presented objectively as part of a secular program of education." The textbook follows detailed principles in a 1999 accord, "The Bible and Public Schools," brokered by Bible Literacy and the First Amendment Center, a nonpartisan program of the Freedom Forum devoted to constitutional liberties. That accord is endorsed by seven major educational organizations and Christian, Jewish and Muslim groups. Stetson said "the important thing was not to compromise on peoples' beliefs. They are what they are." To Schippe, the key to effective education is respect for the biblical text, constitutional law, scholarship, various faith traditions and divergent interpretations. The new textbook was tested in two high schools. Bible Literacy will offer online teacher training through Concordia University in Portland, Ore. The First Amendment Center's Charles Haynes told the news conference that public schools constantly ask him for advice on what Bible course material to use but he's had nothing he could recommend -- "nothing, that is, until now." Haynes says the only previous textbook, decades old, was inadequate because it treated the Bible only as literature, slighting its religious significance. Another program, favored by evangelical groups and used in hundreds of schools, comes from the National Council on Bible Curriculum in Public Schools of Greensboro, N.C. It provides a teacher's outline with the Bible itself as the textbook. My Fragmented Online Life Needs Structure: Netvibes To The Rescue? For example, I wrote recently about the reasons why Last.fm's journal is a cool place to write about music: the integration with Last.fm's music database is really great. Hi, I was just blog surfing and found you! If you are interested, go see my food related site. It isnt anything special but you may still find something of interest.